Bernard A. "Junior" Deimeke, 60. of Trenton Died Wednesday November 26, 2003 at Barnes Hospital in St. Louis. He was born April 16 1943 in Highland to Bernard and Elvera (Seefeldt) Deimeke. He was raised by Herman and Clara (Dall) Wesselmann. He married Bonnie Hegger April 25, 1987 in St. Bernard Church Albers and she survives at Trenton. He was an engineer with the Clinton County Highway Department and a farmer. 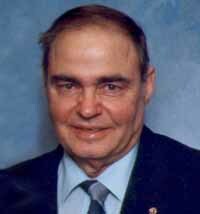 He was a member of St. Mary Church and men’s sodality, Trenton, a Director for the Sugarcreek Ambulance Service, a Director of Tempo Bank, a member and trustee of Trenton Knights of Columbus and past Grand Knight, a member of the Knights of Columbus 4th Degree Bishop Althoff Assembly and past Faithful Navigator, a former District Deputy for the Illinois State knights of Columbus, member of Trenton American Legion Post 778, and had served as a Trenton Cub scout Den leader. In May 0f 2003 Junior, his wife Bonnie and sons Joseph, Daniel and Mark were honored by the Illinois State Knights of Columbus at their annual convention in Springfield by being named "Illinois Knights of Columbus Family of the year for 2003". Funeral services will be held Monday December 1,2003 at 10:00 Am at St., Mary Church Trenton with Fr. James Dougherty officiating, interment St. Mary Cemetery. Friends may call at the Moss Funeral Home in Trenton Sunday Nov. 30 from 4 to 9 PM and Monday Dec 1 from 8 to 9:45 AM. Memorials can be made to an educational trust fund for his sons. Trenton Knights of Columbus services will be held at 8:15 PM Sunday at the funeral home followed by chalice presentation services by the Bishop Althoff Assembly, 4th Degree.